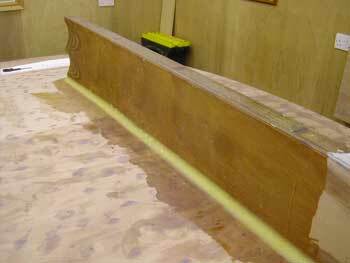 After rushing to get the starboard side of the keel sheathed I thought I'd take some time to prepare before starting on the port side. 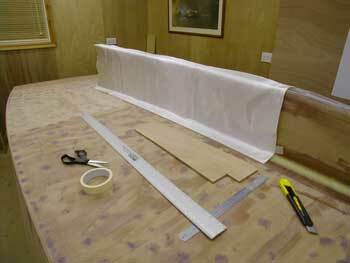 Here I've trimmed the fabric to give a consistent 2" return onto the hull. I've also cut the peel ply. This time I tried wetting the glass without wetting the hull first. That doesn't work. 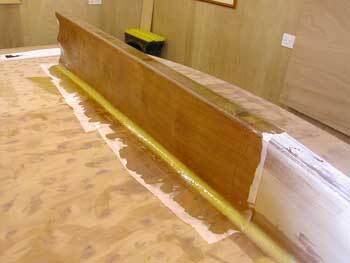 So I removed the cloth and gave the keel a coat of epoxy then put the glass back and continued to wet the glass. Getting ride of the bubbles is a tedious task. They reappear from nowhere. Eventually I'm happy they are all gone and I apply the peel ply. I see bubbles forming under the peel ply in the fillet area, this is really annoying. This is where the 'bubble buster' comes into it's own. That is until you creep up on the gel time when it becomes a bubble creator. Any advise would be much appreciated. Next day, I pull off the peel ply and on the whole it's not bad. No sanding will be required, fantastic. And only a few bubbles in the fillet area which I'll inject or sand out.